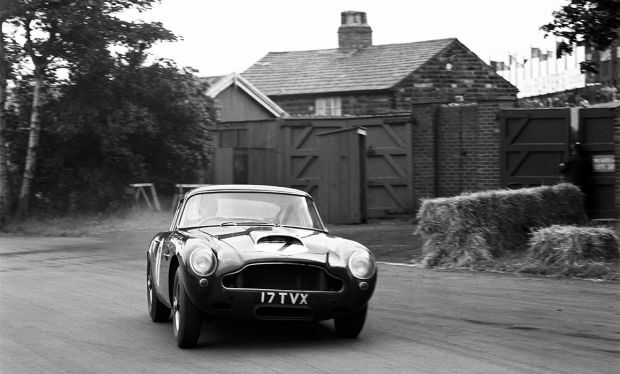 British Built Cars | Aston Martin announce a 'continuation' run of 25 DB4 GTs! Aston Martin announce a 'continuation' run of 25 DB4 GTs! One of Aston Martin’s most iconic models – the DB4 G.T. - is to be celebrated with a special series of 25 track-only continuation cars built to lightweight specification by Aston Martin Works at Newport Pagnell. Launched in 1959, the DB4 G.T. was immediately celebrated as one of the rarest and most revered of all Aston Martins. Evolved from the production DB4 and introduced in the same year Aston Martin scored its historic outright win in the Le Mans 24 Hours, the DB4 G.T. was a true supercar of its day. Shorter, lighter, sleeker and with a more powerful version of the legendary 3.7-litre straight-six engine, not only was the DB4 G.T. Britain’s fastest passenger sports car, it was a born winner, scoring a debut race victory at Silverstone in the hands of Sir Stirling Moss. A total of 75 DB4 G.T.s were built between 1959 and 1963. Of these only eight were lightweight models. Most of which survive today, and values now comfortably exceed £3m. Remaining faithful to the design of those original eight factory lightweights, each DB4 G.T. continuation will be built with Aston Martin Works’ unrivalled experience and exemplary attention. Employing a blend of old world craftsmanship and modern techniques, continuation cars benefit from improvements in engine performance, handling, braking and safety, with great care taken to ensure these enhancements build upon the original’s exceptional qualities while retaining its feel and character. Underlining that authenticity are the continuation car VIN numbers, which carry on from the last original DB4 G.T. ordered - Chassis 0202R - for an unbroken bloodline and impeccable Newport Pagnell-built pedigree spanning half a century. At its heart is a version of the celebrated Tadek Marek-designed straight-six cylinder engine with two spark plugs per cylinder, transmitting its 340bhp to the rear wheels through a four-speed manual transmission and limited-slip differential, just as in the original DB4 G.T. Thanks to its shortened wheelbase the DB4 G.T. is a strict two-seater blessed with greater agility than the regular four-seater DB4. Its body follows the original construction, with thin-gauge aluminum panels fitted over a tubular frame. To improve the accuracy and consistency of the panels, the continuation car’s bodywork uses state-of-the-art digital technology, before being hand-finished in time-honoured tradition. Fittingly for a car created to celebrate one of Aston Martin’s most illustrious competition models, the DB4 G.T. Continuation is built to be enjoyed on track. Aston Martin Works has created a two-year international track driving programme held at a number of the world’s finest race tracks, including the spectacular Yas Marina circuit in Abu Dhabi. The ultimate arrive-and-drive experience, customers may also take advantage of Aston Martin’s dedicated driver training team. Comprised of expert instructors, including Aston Martin Racing’s multiple Le Mans class winner (and Goodwood Revival regular) Darren Turner, they will help customers master driving techniques from an era when track driving was more art than science. Paul Spires, Commercial Director, Aston Martin Works said of the DB4 G.T. Continuation programme: “For over 60 years Aston Martin Works has devoted unrivalled skill and experience to preserving Aston Martin’s heritage. Now we are creating something for the future, with a special series of 25 continuation cars that celebrate one of Aston Martin’s greatest cars - the DB4 G.T. Lightweight. “Built in our recently refurbished, state-of-the-art facilities in Newport Pagnell, the DB4 G.T. Continuation is hand built in the same location as its illustrious forebears, and marks the return of production to the historic home of Aston Martin for the first time since the last Vanquish S was completed in 2007. Combining the authenticity of a hand-crafted David Brown era car with sympathetic application of modern engineering advancements and performance enhancements, the DB4 G.T. Continuation is a fusion of classic design and contemporary methods. First deliveries of DB4 G.T. Continuation will commence in QTR 3 2017.